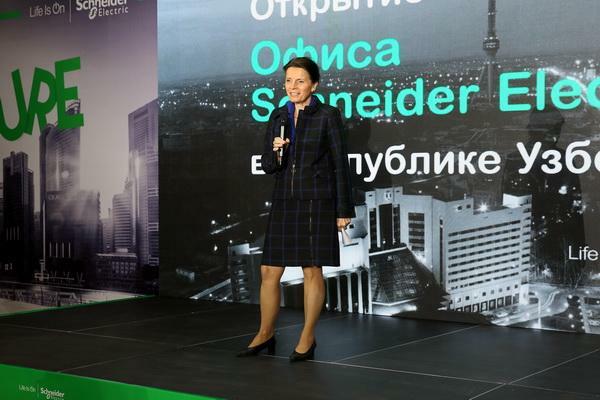 Tashkent, Uzbekistan (UzDaily.com) — Schneider Electric, a global expert in energy management and automation, opened an office in the Republic of Uzbekistan. 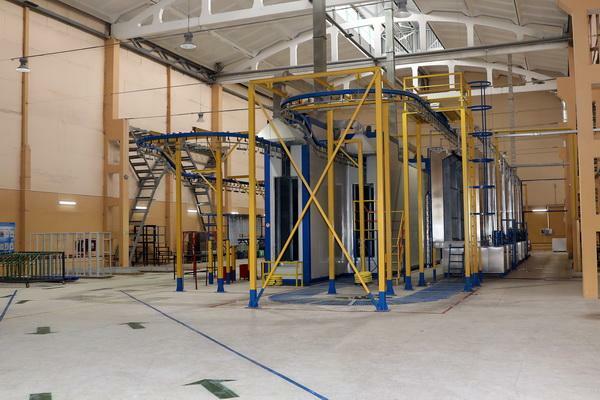 Now, a representative office of the company will work in Tashkent, and it will implement a project for assembling high-voltage and low-voltage switchboard equipment at the production site of IE Energo Systema NVA LLC jointly with partners. During the event, Deputy Minister of Economy and Industry of the Republic of Uzbekistan Botir Usmonov and Ambassador Extraordinary and Plenipotentiary of France to the Republic of Uzbekistan Violaine De Villemeur shared their vision of the digital development of the country. On the eve of the event, a meeting was held between the leaders of Schneider Electric and the Minister of Economy and Industry of the Republic of Uzbekistan, Botir Khojaev. “We are planning a long-term development of relations with Uzbekistan — this is a promising, dynamically developing region that has embarked on the path of openness, modernization, increasing its industrial potential. Our technologies, solutions and specialists will help many companies to implement complex investment projects and realize the ambitious plans of the state deep modernization of the economy and increasing the level of digitalization”, — said Johan Vanderplaetse, President of Schneider Electric in Russia and the CIS. The leaders of Schneider Electric, in turn, spoke about the results and development plans, as well as the decisions, the use of which will contribute to more efficient development of the energy, oil and gas, transport, industrial and construction industries of Uzbekistan. “Today Uzbekistan is a strategically important market for Schneider Electric, which is confirmed by our investments in further expansion of production. This gives us the opportunity to be closer to the customer. All Schneider Electric manufactures around the world adhere to strict quality standards. We are confident that this will make the use of our technologies even more effective for our partners and customers,” Armen Badalov, Vice President for Strategy, Innovation and Regional Development of Schneider Electric Russia and CIS commented. During the event, guests, representatives of the largest companies of Uzbekistan, including Uzbekenergo, Uzbekneftegaz, Uzkhimprom, TashkentCity, Beeline, UzbekAtom, also visited the production site of Schneider Electric partner, ENERGO SYSTEMA NVA, which already produces the low-voltage and high-voltage equipment Schneider Electric. These solutions have already been implemented at AGMK, Discover Invest, TMZ, Uzbektelecom, NavoiAzot, Maxam Chirchik. “Schneider Electric partners are transferred technologies, and these are constructs, licenses and drawings, and the necessary financial support is provided, flexible and advantageous cooperation conditions are provided that will allow us to jointly develop the production of the most modern types of equipment and integrated solutions. 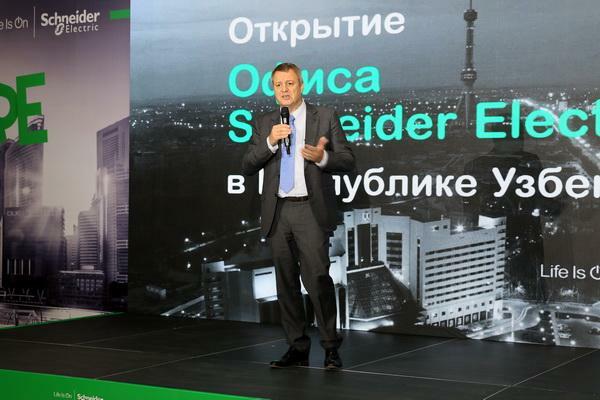 In addition, Schneider Electric engineers provide comprehensive support to ENERGO SYSTEMA NVA specialists,” Alyer Bakhronov, head of the Schneider Electric office in Uzbekistan, said. Tashkent, Uzbekistan (UzDaily.com) — Ambassador of Uzbekistan to the Netherlands Dilyor Khakimov met with the Chairman of the Board of Management of Ballast Nedam and Director of Ballast Nedam N.V., Cenk Düzyol, and representatives of the export credit agency. During the talks, the Dutch side assured its readiness to implement infrastructure projects in Uzbekistan, including in Namangan region. In particular, the readiness was confirmed to use advanced Netherlands technologies and knowledge in construction of residential complexes, hospitals, shopping centers, as well as industrial infrastructure facilities. In this regard, an agreement was reached on defining a specific project using various forms of financing, including public-private partnerships, as well as attracting the capabilities of Atradius credit agency. After defining and agreeing on the project, representatives of Ballast Nedam will visit Uzbekistan to hold meetings and negotiations in relevant ministries and agencies of the country. Tashkent, Uzbekistan (UzDaily.com) — On 24-27 April, President of Uzbekistan Shavkat Mirziyoyev will pay a visit to China at the invitation of PRC President Xi Jinping to take part in the events of the second International Forum “One Belt, One Road”. More than 40 heads of state and government of foreign countries, international and regional organizations are expected to attend the forum. The agenda includes issues of further enhancing economic cooperation, intensification of interaction in search of new sources for long-term growth, promotion of green economy and innovation, implementation of priority infrastructure projects in the region. The President of Uzbekistan is anticipated to meet with Chinese President Xi Jinping and Chairman of the Standing Committee of the National People’s Congress Li Zhanshu. The sides plan to discuss current issues of further strengthening Uzbekistan – China comprehensive strategic partnership, as well as those in the regional and international agenda. The President of Uzbekistan will hold a number of bilateral talks with the heads of delegations of foreign countries and international organizations attending the forum. Tashkent, Uzbekistan (UzDaily.com) — On 16-17 April 2019, a delegation of Uzbekistan led by Deputy Prime Minister Elyor Ganiyev visited the United States on a working visit, the press service of the Ministry of Foreign Affairs of Uzbekistan said. A fruitful meeting was held with US Secretary of Commerce Wilbur Ross. The implementation of the agreements reached during the visit of Wilbur Ross to Uzbekistan in October 2018 and the Uzbek-American business forum was reviewed. As noted during the meeting, the official visit of the President of Uzbekistan Shavkat Mirziyoyev to the United States in May 2018 allowed the relations between the countries to a new level. Progress is observed in all areas of the bilateral agenda. Cooperation in the trade and investment sphere has received special development. The volume of trade between Uzbekistan and the United States over the past year has almost doubled, the number of joint ventures is increasing. The meeting also discussed preparation for a number of important joint events, in particular, a major business forum in Navoi on 16-17 May, the first “certified trade mission” of the US Department of Commerce to Uzbekistan on 18-20 June and the annual Uzbek -American business forum in Washington on 21-22 October. An exchange of views took place on the prospects for cooperation within the framework of technical assistance programs of the Ministry of Agriculture and the US Treasury, and measures were discussed to expand cooperation in the use of financial instruments and concessional loans from Eximbank and OPIC, as well as the newly created US International Development Finance Corporation, in which Uzbekistan will be given priority attention. In this context, the Minister congratulated the Government of the Republic on raising the country’s credit rating according to the OECD classification to the 5th category. It should be noted that the improvement of the position of our country will contribute to attracting the latest American technologies and know-how to Uzbekistan with the active support of these financial institutions. A representative of the US administration welcomed the republic’s desire to become a member of the WTO. The timeliness and practical significance of sending an expert from the United States Agency for International Development (USAID) to Uzbekistan as an advisor to the Minister of Investment and Foreign Trade on issues of joining the said organization were noted. Separately the sides discussed the measures taken by the Government of Uzbekistan to protect intellectual property rights. As noted during the negotiations, the adoption of laws on ratification by the Republic of the Geneva Convention on phonograms of 1971 and treaties of the World Intellectual Property Organization in the field of the Internet, together with achievements in the field of eliminating child and forced labor, create the necessary prerequisites for maintaining the status of the beneficiary country of the General Preference System, involving the possibility of duty-free trade with the United States. At the meetings of the delegation of Uzbekistan with the Deputy Assistant to the President — Senior Director for South and Central Asia of the National Security Council of the United States Liza Curtis, Assistant Secretary of State for South and Central Asia Ellis Wells, as well as a special adviser to the Vice President of South and Central Asia Michael Catron took place a thorough exchange of views on the prospects of the Uzbek-American interaction in the political, trade, investment and cultural-humanitarian spheres. The important aspects of international and regional politics and security are discussed. Appreciation was expressed to the American side for the increase in the volume of financial and technical assistance provided to Uzbekistan in the framework of various US government programs. With the Deputy Assistant Secretary of the Treasury of the United States, William Lary Macdonald, prospects for attracting highly qualified consultants to help develop proposals for the development of fiscal policy, public debt management and investment, improving the efficiency of the budget process, strengthening the banking sector, and counteracting economic crimes were discussed. At the end of May, it is planned to organize a visit of representatives of the US Treasury Technical Assistance Office to Uzbekistan to determine the most priority areas and forms of interaction. During the meeting with the Acting Deputy Director of the United States Geological Survey (USGS) Cindy Lodge, an exchange of views was held on practical measures to increase fruitful cooperation with Uzbekistan. Following the results, a Memorandum of Cooperation was signed between the State Committee of the Republic of Uzbekistan on Geology and Mineral Resources and the USGS. The document provides for the establishment of cooperation in the field of geology, as well as the organization of joint trainings and educational programs for Uzbek specialists. During the talks with Carolyn Lemm, Chairman of the US-Uzbekistan Chamber of Commerce, a number of promising projects of chamber’s member companies in Uzbekistan, as well as measures to accelerate the implementation of the Road Maps adopted following two business forums in New York and the city of Tashkent in 2017-2018 and in the framework of the visit to the highest level in the United States in May 2018 were discussed. In general, according to the Embassy in Washington, the visit of the Uzbek delegation to the United States allowed us to hold a series of fruitful meetings in specific areas of bilateral cooperation, identify areas that require increased interaction, and agree on measures to further expand and deepen trade and investment relations. Tashkent, Uzbekistan (UzDaily.com) — At the Ministry of Energy of the Republic of Uzbekistan, Minister of Energy Alisher Sultanov met with a number of delegations from the Republic of Korea on 18 April 2019. During the meeting, the Korean side noted the dynamic development of modern Uzbekistan, in particular, the President of the Export-Import Bank of Korea (Korea Eximbank) Ying Sung highly appreciated the changes in the country and noted that reforms in the energy sector are one of the most important factors of sustainable social development. -economic growth of the country, increasing business activity and investment attractiveness of the republic, living standards and welfare of the population. The parties discussed the implementation of projects, financed by Korea Eximbank, including the construction of a plant for the production of synthetic liquid fuel (“Uzbekistan GTL”) and the Surgil Gas Chemical Complex (“Uz-KorGasChemical”). Successful implementation of such projects is also a significant indicator for Korean investors planning investments in the Republic of Uzbekistan. The meeting also discussed projects, proposed for implementation with the financing of Korea Eximbank. These include the modernization of the Bukhara refinery, the construction of a CCGT at the newly constructed thermal power plants, the introduction of an automatic control and information collection system (SCADA), as well as an automatic control system and metering of electricity consumption (AMR). The Uzbek side also proposed to consider the possibility of raising funds from the Korean Economic Development and Cooperation Foundation (EDCF) for SCADA projects. It was also agreed to establish a joint working group to ensure transparency and speed up the procedures related to opening credit lines in order to start financing projects before the end of 2019. A discussion was also held with the delegation of the Korean Energy Agency (CEA) headed by the president of the agency Kim Chan-Seb on the issues of improving the energy efficiency of thermal power plants, modernizing and improving the energy system. The Korean side expressed the opinion that it would be advisable to replace the equipment on worn-out thermal power plants, and not to build new capacities. The delegation expressed interest in visiting existing power plants in Uzbekistan. The Ministry of Energy also accepted the delegation of the company Korea Telecom (KT), headed by the senior executive vice president Young-Young Pak. The Korean side noted the success of the project on the implementation of the AMR system and expressed interest in participating in SCADA projects, as well as the project of energy management systems (EMS). The company is ready to assist in other projects that require the introduction of modern energy metering technologies, the modernization of the relevant infrastructure, as well as in personnel training. During the meetings, Korean companies Posco International, Kepco and Hyundai expressed interest in cooperating in developing potential projects through the creation of a consortium. With this in mind, on 19 April, during the Uzbek-Korean business forum, a Memorandum was signed with a consortium for cooperation in the energy sector. The parties agreed to create a joint working group to study and develop projects for the construction of combined cycle CCPP, implementation and modernization of applicable automatic control systems and data collection (SCADA), power management systems (EMS) and relevant information and modern technologies, as well as in other areas cooperation of mutual interest. Posco International also additionally requested a new block for geological exploration at potential natural gas fields. The Korean side expressed its willingness to assist in the training of qualified personnel and the organization of advanced training programs for the fuel and energy sector of Uzbekistan. Tashkent, Uzbekistan (UzDaily.com) — Minister of Investment and Foreign Trade Sardor Umurzakov held a meeting with Minister of Industry, Trade and Energy of South Korea Song Jung Mo on 18 April. During the meeting, issues of expanding trade and economic cooperation and the establishment of new formats of investment partnerships were discussed. In the course of the productive dialogue, the parties, noting the positive results achieved, agreed on the unprecedented prospects for cooperation between the two countries, bearing in mind the significant potential for interaction in the oil and gas, mining, chemical and petrochemical industries, light industry, banking and finance, education and health care. In the light of the preparations for the Uzbek-Korean business forum held during the visit, the delegation worked out all the details of the implementation of the projects planned for implementation and discussed the conditions for further cooperation. Tashkent, Uzbekistan (UzDaily.com) — Governmental delegations of Uzbekistan headed by Deputy Prime Minister Elyor Ganiyev and Kyrgyzstan led by Deputy Prime Minister Zhenish Razakov held a meeting in Ferghana on 20 April. According to the press service of the Ministry of Foreign Affairs of Uzbekistan, the parties discussed issues related to checkpoints at the Uzbek-Kyrgyz State border, included in the intergovernmental Agreement on checkpoints across the State border dated 24 July 2004, and at intersections that are not included in the agreement. Following the talks, a Protocol was signed, which fixed an agreement on holding the next meeting of the working groups of the two countries on the delimitation and demarcation of the interstate border in the near future in Kyrgyzstan in accordance with the schedule for 2019, as well as continuing to agree on the draft Protocol on changes and additions to the existing Agreement on the checkpoints across the State Border. The meeting was attended by the leaders of the adjacent regions of the two countries — Andijan, Namangan, Ferghana regions of Uzbekistan and Batken, Jalal-Abad, Osh regions of Kyrgyzstan. Tashkent, Uzbekistan (UzDaily.com) — On 15 April 2019, the Embassy of Uzbekistan in Japan in cooperation with the Research Institute for the Study of the Problems of the East Asian Community (EACI) organized a round table on the topic “Strengthening regional cooperation: positive experience on the example of Central Asia and the East Asian community”. This event was organized in order to familiarize the Japanese expert and analytical circles and the general Japanese public with the results of the International Conference “Interconnectedness in Central Asia: Challenges and New Opportunities” (on 19-20 February 2019, Tashkent), and, in general, policy of Uzbekistan on strengthening neighborhood and expanding regional cooperation. The event, held at the EACI building, was attended by representatives of the Japan Institute of International Relations (JIIA), expert and analytical circles and universities of Japan, who specialize in the study of Central Asia. Participants of the event were informed in detail of the main priority directions of foreign policy of Uzbekistan in the Central Asian direction, in particular, active efforts to strengthen good-neighborly policy with the countries of the region under the leadership of the President of the Republic of Uzbekistan Shavkat Mirziyoyev. It was emphasized that due to this policy of the Head of Uzbekistan and the political will of the leaders of the Central Asian countries, an absolutely new political atmosphere of mutual trust and respect has developed in the region, which has allowed to intensify diverse regional cooperation, primarily in the trade, economic, cultural and humanitarian spheres. It was stressed that during the past international conference “Interconnectedness in Central Asia: Challenges and New Opportunities” in Tashkent in February 2019, experts were able to exchange views and develop new proposals for deepening regional cooperation. The participants of the round table were distributed texts of the resolutions of the UN General Assembly «Strengthening regional and international cooperation to ensure peace, stability and sustainable development in the Central Asian region» and «Enlightenment and religious tolerance», materials about the Multi-Partner Trust Fund on Human Security for the Aral Region. The Japanese participants also watched a special video prepared by the Embassy about the international conference “Interconnectivity in Central Asia: Calling you and new opportunities «in February in Tashkent and the Central Asian foreign policy vector. The first Japanese ambassador to Uzbekistan, Director of the EACI Research Institute, U. Magosaki, noted that Uzbekistan, which borders on all Central Asian countries and Afghanistan, has a unique geopolitical location. At the same time, the region had previously experienced tensions in Central Asian countries, which were influenced by the differences between them regarding water use, borders, etc., as well as the policies of large external players. At the same time, after the election of Shavkat Mirziyoyev as the leader of Uzbekistan, a new atmosphere of political trust and mutual respect is observed in the region. He stressed that Uzbekistan under the leadership of Mr Mirziyoyev is looking for new opportunities to expand regional cooperation and this is already yielding positive results. In a short period, significant progress was achieved in regional cooperation, in particular, the elimination of topical issues that were an obstacle to the development of intraregional relations. Magosaki said that the policy pursued by Tashkent today is inherent in Uzbekistan since ancient times, since for centuries the republic has been a country that most of all in the world has carefully preserved the value of coexistence. Based on the topic of the round table, the President of the Research Institute, the former Prime Minister of Japan Y. Hatoyama devoted his presentation more to presenting his views on regional cooperation in the East Asian community, which he considers a priority of the activities of his institution. He also gave a high assessment to the current positive dynamics of strengthening cooperation between the countries of Central Asia, which got its start after the election of Sh. M. Mirziyoyev as President of the Republic of Uzbekistan. The speaker drew attention to the importance of consolidating efforts and the earliest resolution of the complex of problems associated with the drying up of the Aral Sea, which has a negative impact not only on Uzbekistan, but on all the states of the region. He stressed the seriousness of the Aral tragedy, which he considers an environmental problem of a global nature and which cannot be solved by the efforts of one state. Y.Katoyama highly appreciated the efforts of Uzbekistan in this direction, including the initiative to create a Multi-Partner Trust Fund for Human Security in the Aral Sea zone. The President of the Japanese Research Institute separately highlighted the measures taken by the Central Asian states to solve border problems, describing them as a good example that could be used in the East Asian community, given that Japan also has territorial problems with other states. Tashkent, Uzbekistan (UzDaily.com) — On 17 April 2019, the Minister of Foreign Affairs of the Republic of Uzbekistan Abdulaziz Kamilov received a delegation of the French Republic led by the Co-Chairman of the Intergovernmental Commission on Trade and Economic Cooperation, the Secretary of State to the Minister for Europe and Foreign Affairs Jean-Baptiste Lemoyne. At the meeting, the implementation of agreements reached during the official visit of the President of Uzbekistan Shavkat Mirziyoyev to France on 8-9 October 2018, as well as prospects for further development and strengthening bilateral relations in all areas of mutual interest were discussed. An important role in building up ties in these areas should be played by the opening in Samarkand of the Honorary Consulate of France, which began its activity on 16 April. According to the Ministry of Foreign Affairs of Uzbekistan, the sides exchanged views on the schedule for the upcoming Uzbekistan – France contacts in 2019, including holding political consultations and other joint events. Tashkent, Uzbekistan (UzDaily.com) — At the invitation of the President of the Republic of Uzbekistan Shavkat Mirziyoyev, the President of the Republic of Korea Moon Jae-in will pay a state visit to Uzbekistan on 18-21 April.